I feel like some of you want to just scream at me because our master bedroom makeover is STILL not finished. Forgive me! You know how things just keep coming up & that is the thing that keeps getting pushed to the side? Well, yah that’s what keeps happening to us. 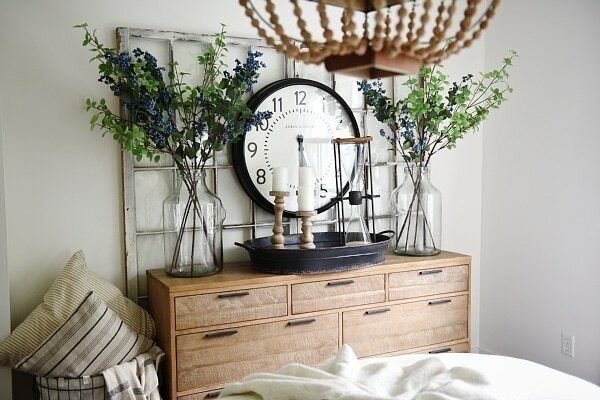 I REALLY want to get our room done & it is almost there… I mean so close! All of our furniture is in the room for starters. 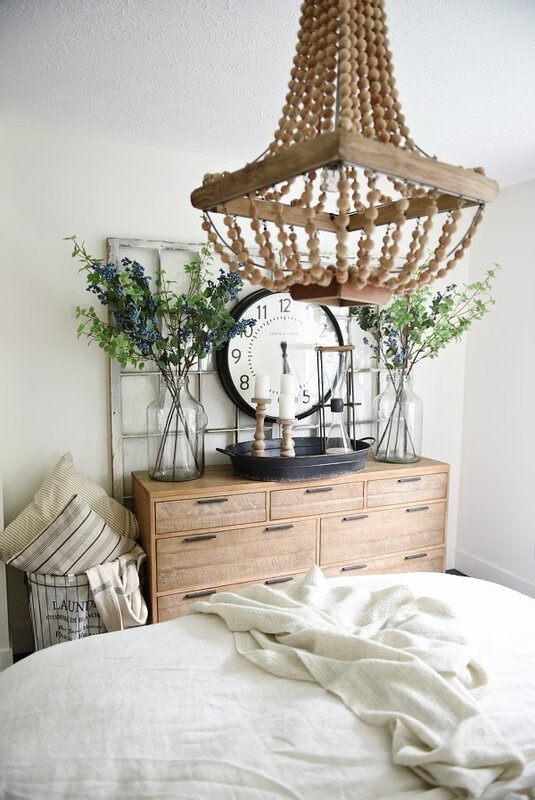 You can see our bed [here], the light fixture [here], & now today it’s all about that dresser we chose for the space. I wanted our room to be different than the rest of the house. It has that cozy cottage vibe, but it also has a more modern masculine edge to it. 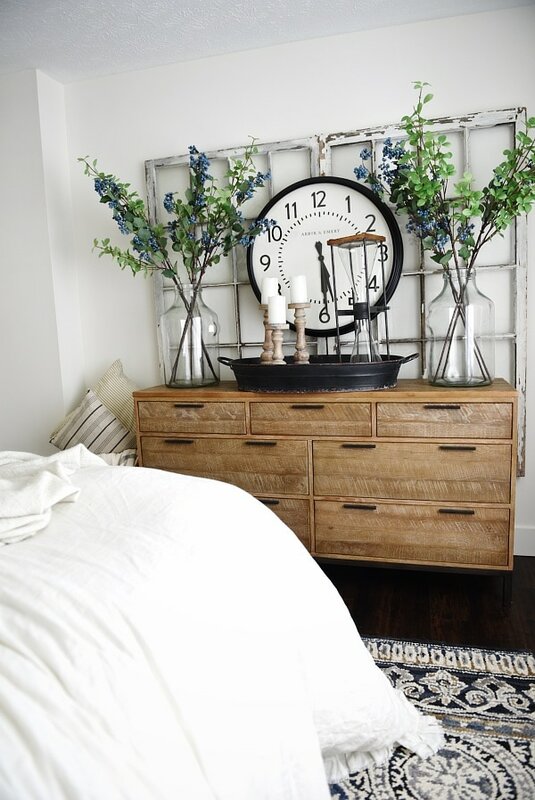 The dresser isn’t styled permanently for the bedroom makeover, but I placed a few items that we are using in the room makeover on the dresser to take few photos of the piece so that you could get a feel for the room. 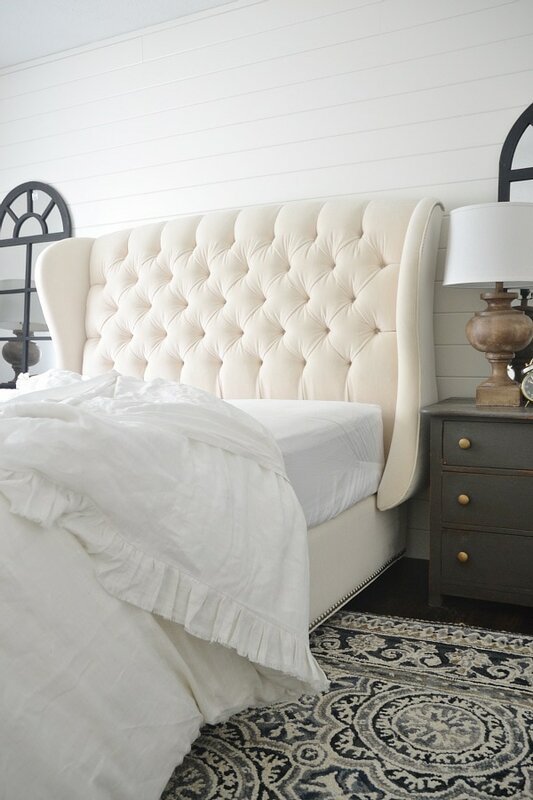 I wrote about the plan for our master bedroom in the post about our bed & one of the plans was to have some nice quality furniture for our “grown up” room. That may seem weird, but after moving 4 times in the military life we finally feel a little more settled & we feel like we can own some more high end pieces & mix them with our “Junkin” finds like the nightstands in our room which cost me next to nothing & I added some paint to make them shine. 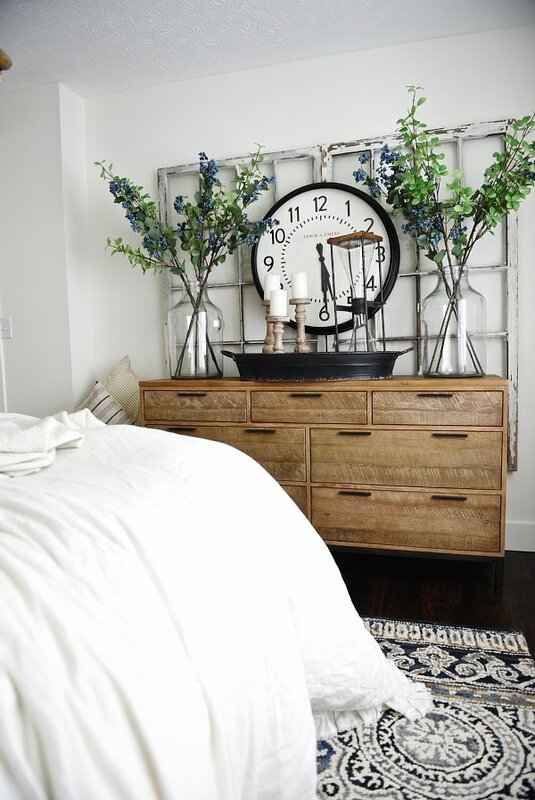 This dresser was one of two furniture pieces in the room from Arhaus furniture, a store we fell in love with when we lived in North Carolina. We would go into the store & sit on the couches & dream about the pieces we would have when we settled down somewhere… & now we are here in Michigan & making our master bedroom a room that we love. Slowly. Very slowly. 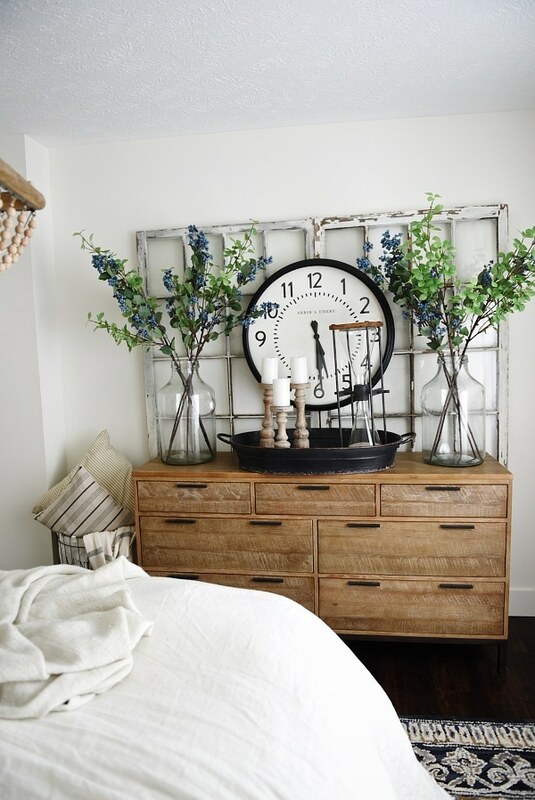 The dresser we chose is the Palmer 7 drawer dresser & we love it for it’s clean lines, rustic wood, & all of the storage. 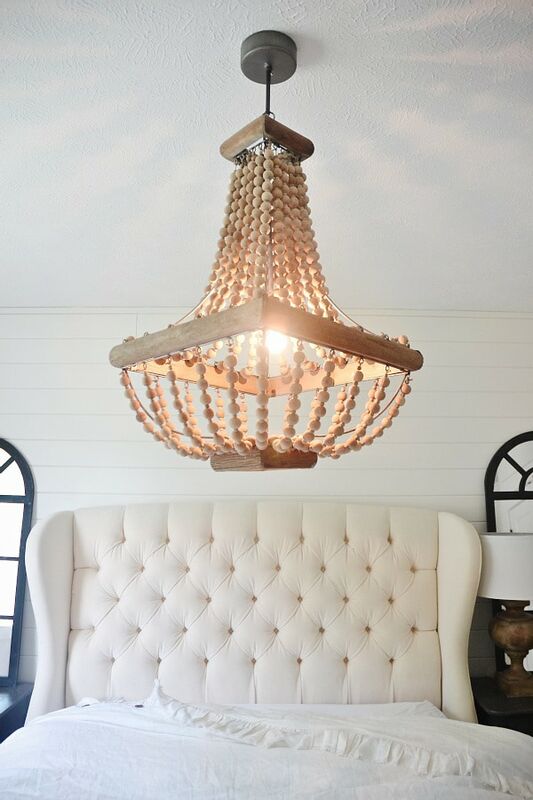 *We worked with Arhaus Furniture on this post, but all opinions are my honest thoughts & all photos are my own in our house. 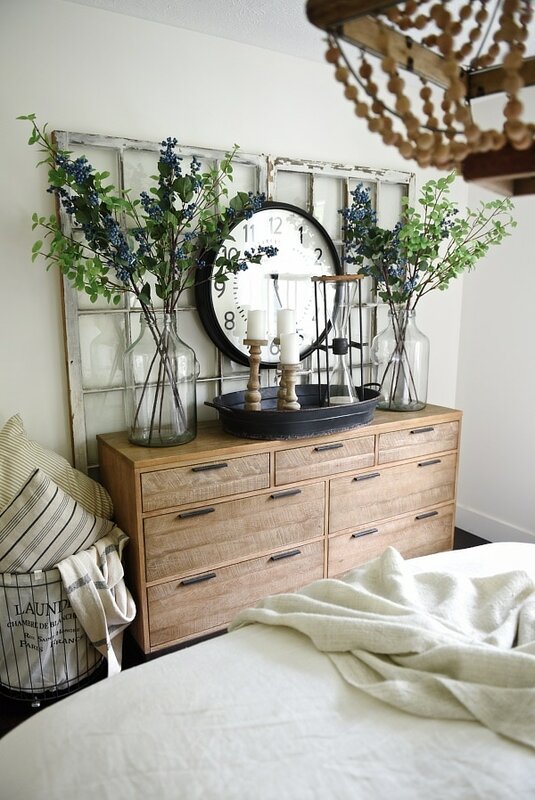 We love Arhaus Furniture! 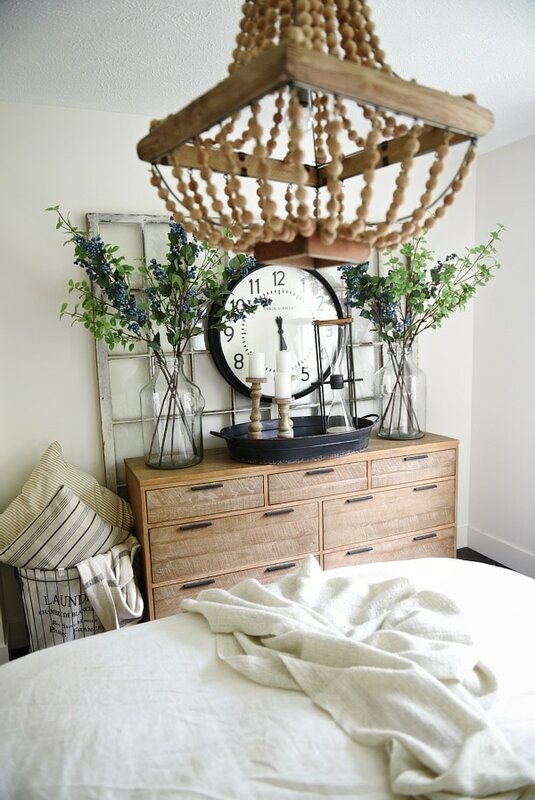 The dresser looks wonderful in the room, and it does have beautifully soft, clean lines! I missed that light fixture somehow? It’s a beauty too! Nothing wrong with taking your time, I know you two get wicked busy!! Your room is beautiful. I fell in love with your bed and have been dying to see how you finish your room. It’s really coming together. I can’t wait to see it finished. Do you mind me asking, what colors you painted the walls? It’s such a calming color. Can you tell where the clock is from? What color is the dresser? I am looking at it online, and I want to make sure I am looking at the right color because I love the one you have!